Backing up data and files is one of the most important areas in the IT world. It is now essential for all the computer users, system administrators, Information security officers and businesses to backup their critical data, in order to protect it from loss or corruption. However, storing the data in one backup location is not sufficient to safeguard your important data and files. It is therefore recommended to use the 3-2-1 backup strategy to protect your data and increase your chances of recovering quickly from the lost or corrupted data. Have 3 copies of your data (3 backup copies of your primary data). 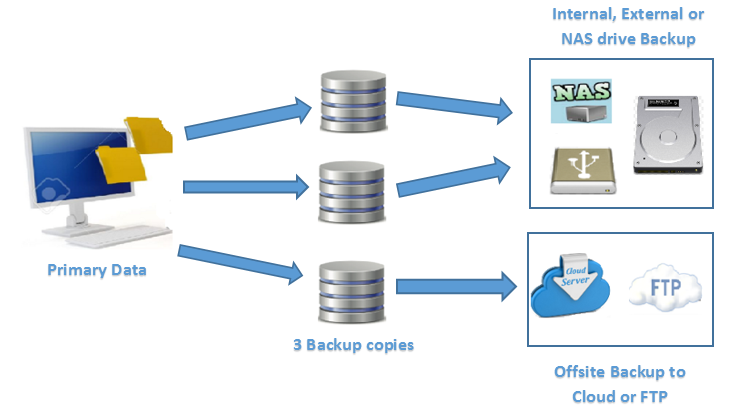 Save 2 backup copies at 2 different locations (external drive, NAS/Network drives, FTP, Cloud etc). Keep 1 backup offsite (Cloud, FTP etc). With SyncBackPro/SE you can easily implement the “3-2-1 backup rule” in your business or home environment and reduce the risk of losing data by keeping redundant copies of your data in different locations. With three backup copies you greatly improve the chance of recovery, and protecting your data against different types of technology failures or environmental hazards. You can accomplish this easily in SyncBackSE/Pro, by creating 3 different profiles with the Source pointing to the location where your primary data is stored, and Destination pointing to 3 different backup locations (such as an internal drive, NAS drive, external hard drive, Cloud, FTP etc.). Then put the profiles into a group and run the group to make three backup copies of your primary data. This can be fully automated by scheduling the group to run periodically, e.g. every day at 7pm. If you save the primary data and its backup copies in the same location (for example: on different drives on the same computer), and if your computer crashed or is attacked with a virus, then you will lose your primary data as well as your backup copies at the same time. Therefore, it is recommended to save two of your backup copies at two different places, to reduce the risk of a single event destroying multiple copies. With SyncBackSE/Pro you can achieve this, by configuring the Profile’s destination path to point to different locations. For example: If the destination path for the first profile is configured as an internal drive, then you can consider configuring the second profile to an external drive and third profile to NAS drive, FTP, Cloud etc. If you keep all your backup copies in the same building or room, and if there is a fire, accident or theft, then you will lose all your data. Hence, physical separation between copies is important and it is always recommended to store one backup offsite (for example: cloud or FTP - that is away from the location where your primary backups are stored). You can use SyncBackPro/SE to backup data to an offsite FTP or FTPS server. Use SyncBackPro to backup files to an offsite SFTP server or Cloud server (such as Google Drive, OneDrive, Box, Dropbox, Amazon S3, Amazon Drive, Azure, Google Storage, Office 365 (OneDrive for Business and SharePoint), or SugarSync). Hint: cloud backup solutions are a lot cheaper than they used to be! While it's certainly better than nothing, having one single backup is not sufficient to truly safeguard your important data/files. Thus, home users, individuals, small businesses or large organisations can use SyncBackPro/SE to implement a 3-2-1 backup plan in your environment to easily recover from lost data and mitigate the effects of disasters.